SIS Professors Patrick Jackson, Rose Shinko, and Elizabeth Cohn received American University’s Ann Ferren Curriculum Design Award for their efforts to restructure the undergraduate curriculum in International Studies. The award was presented at the annual Ann Ferren Conference on January 9, 2015. The Curriculum Design Award recognizes creative integration of the learning outcomes of AU’s General Education Program into the design of an undergraduate major or interdisciplinary program. The award committee cited the team’s “collaborative work to restructure the undergraduate curriculum in International Studies” which “clearly illustrates both an understanding of alignment and of the importance of carrying forward the concepts and themes introduced in the General Education program.” The committee noted that the team’s comprehensive approach highlights the importance of conceptual integration along with the role of meaningful assessment. In August 2011, SIS Dean James Goldgeier convened a task force on the SIS undergraduate curriculum that spent a year developing a set of recommendations for revising the BA in International Studies. Chief among its goals was to ensure that the BA program remained an interdisciplinary education grounded in the liberal arts. Jackson, who serves as associate dean of undergraduate education at SIS, led a process of renumbering all SIS undergraduate courses, instituting new prerequisites, reorganizing the substantive courses into eight thematic areas, expanding the research methodology offerings, and creating new First Year Seminars and Senior Capstone projects. 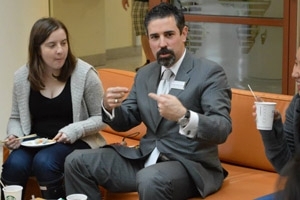 “Initially, what we saw was no overarching set of goals and no systematic thought as to how classes connected, but we really wanted to capitalize on the incredible intellectual diversity of the faculty. Our job was to organize what already existed, and match students with courses that were appropriate for their interests. We wanted to give students the ability to shape their undergraduate degree into something individual for each one of them,” explains Jackson. Jackson notes that the task force wanted to preserve the multifaceted aspect of the undergraduate program at SIS. “We wanted to bring some order to the program without reducing the school’s important scholarly breadth,” he says. The task force also wanted to ensure that students could have an undergraduate education with a specific focus, which led to the creation of eight thematic areas, as well as nine credits with a regional focus. "The changes we made reflect our commitment to the development of an engaging, student-centered curriculum that provides our students with opportunities to develop their critical reading, thinking, and writing capacities,” says Shinko, who serves as undergraduate program director. “I often meet with prospective students and their parents, and they never fail to express how impressed they are by the comprehensive academic design and intellectual structure behind the SIS curriculum. This is one of the most cutting-edge international studies programs, which enables students to chart their own academic journey across our eight thematic areas,” says Shinko.